With a full moon approaching and some unsettled weather bringing rain to the Bay Area, I decided to get a night hike in before the predicted precipitation arrived. I started in the afternoon around 3pm so that I could do that portion of the hike in Pecheco State Park while the sun was still out. Early rains have started to green the Diablo hills nicely and it seemed a shame not to enjoy seeing it so. The first five miles of hiking took place on random trails (which aren't much of trails, to be fair) that parallel Whiskey Flat Road on the park's perimeter. Most of the area both inside and outside the park is used extensively for grazing, keeping the grass short and making for easy cross-country travel. Aside from the cows that were seen frequently, I spotted a few elk that took off upon my approach but not much else. 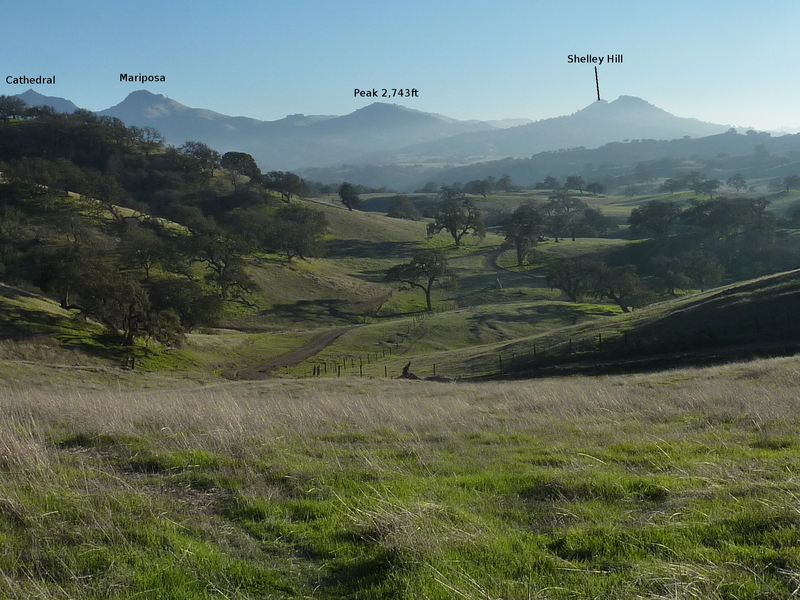 The two officially unnamed summits I was after are in the southeast corner of Santa Clara County, on the border with Merced County and 3-5mi south of the State Park. Reaching the park boundary around 4:15p, I continued on Whiskey Flat Rd as it follows the county boundary fairly well, heading south through Frenchs Flat. Though not so flat, it consists of gentle rolling hills with a reservoir found at the west end and a ranch building adjacent to a cattle pen found to the east atop the county border. Though it appears to be more of a hunting lodge periodically occupied and I saw no sign it was being used currently, I avoided it by leaving the road and following cross-country through the rolling grass drainages to the west. By the time I had regained the road further south the sun had set and the moon was shining brightly. Unfortunately, fog was pouring in from the west over the crest of the range and it was not long before the fog had enveloped me and the moon could no longer be seen. I passed through a gate labeled "Shelley Hill" which seemed to give a name to the first summit I visited, completely in the fog. It was not as dark as one might think because the moon overhead gave the fog a diffuse glow that was sufficient to see without needing a headlamp, even as I scrambled up steep slopes of uneven, cow and pig disturbed earth with a fair share of rocks to keep me on my toes. The light was dim enough that I started thinking about mountain lions and how easy it would be for one to mistake me for some kind of usual prey. I took to wearing my headlamp on the back of my head - I didn't want to lose my night vision, but thought the light would be sufficiently alarming to keep a mountain lion at bay. I've seen a number of those electric fences in various parks I've visited this year. In every case they were portable and being used for the purpose of confining sheep and goats to areas of high grass for them to 'mow'. Surely a product of the drought and extreme fire danger. Usually, there's a small camper or two nearby occupied by the shepherd(s) while the sheep do their job. Maybe the sheep had finished their task and been removed while the fencing crew had yet to complete the project by removing the fence?